Face the Fear … But do it Anyway! Fear. It’s a funny thing. An estimated 10 million people in the UK alone have phobias. That’s about 1 in 6 of us. Claustrophobia and its opposite, agoraphobia, are amongst the ten most common phobias. Fear of flying (aerophobia) and fear of spiders (arachnophobia) are in there too. No surprises there. Not in the top ten list but coulrophobia is quite common and at least one of our Write Romantics has it … fear of clowns. Having seen Stephen King’s ‘It’, I’m not surprised! But there are some strange phobias out there too. Did you know that alliumphobia is the fear of garlic, Dutchphobia is the very un-PC fear of the Dutch (why?!) or that geniophobia is the fear of chins (yeah, not sure I get that one either). And I have two absolute classics for you here – hexakosioihexekontahexaphobia is the fear of the number 666 and hippopotomonstrosesquipedaliophobia is the fear of long words. Oh the irony that someone suffering from this can’t tell anyone what they’re suffering from because the word itself would fill them with fear! Have you ever heard of novelrejectionphobia though? No? Well, that’s probably because I’ve just made it up but it’s a very real affliction that I’m facing right now. And I don’t like it. I thought of the idea for my novel in 2002 and first put fingers to keyboard in 2003 so this year signals the culmination of a decade of work during which time I’ve learned so much about writing. I’ve written and re-written my novel (especially the start) more times than I care to remember. I’ve received several positive beta-reader reviews and two great NWS reports. So, armed with a box of freshly-printed business cards, a folder of synopsis print-outs for Novel 1 and the remaining two in the trilogy, and a handful of CDs containing Novel 1 should any agents of publishers ask for the whole thing, I attended my first RNA conference with a positive attitude that I was about to take my next step on the road to becoming published. But things didn’t quite work out as my imagination had planned. I didn’t ‘fall naturally into conversation’ with any agents or publishers in the dinner queue and the two editors I met in my booked sessions didn’t throw their arms round me squealing, “I loved it. I MUST have the whole MS. NOW! And here’s fifty grand to secure the publishing deal!” I came home with all the business cards, print-outs and CDs still intact. Don’t get me wrong; the two editors I saw really liked my MS. They were really positive about my voice and my style and the plot but one wanted the story to start at a slightly earlier point with some more action (both my NWS reports had said to start it later) and the other just wanted to make sure certain points came out in the MS. To be fair, they did, but a conversation with her gave me an epiphany on making a change to the start that would give my protagonist a really strong reason for seeking The One which would also provide the action the other editor sought. All I needed to do was one more edit then get it sent off to agents. That wouldn’t take long. Schools go back next week which means summer is over. Which means six weeks has passed. Six weeks during which I have been unemployed, having lost my job in late July so, in theory, have had all the time in the world to write. OK, so I spent a week on holiday and we had a weekend camping, I decorated the lounge, I cleared out the garage, I had a major clear-out of my daughter’s toys, books and clothes (which took several days) and I’ve had various appointments like doctor, dentist, hygienist etc. Not to mention actually spending time with my six-year-old and taking her out on a handful of day-trips. But there have been ‘spare’ days. Days where she’s gone to her Nana’s. Days where I’ve had cooking and cleaning to do but where I could have done it quickly and dug out my manuscript. Yet something has stopped me. Yes, novelrejectionphobia has reached out its inky paws and slapped me about with a copy of Jane Wenham-Jones’s ‘Wannabe a Writer?’ “Yes,” I’ve cried, “Yes I do! But what if I’m not good enough …?” And so we get to the crux of the problem. Sending a previous incarnation of my MS to a few friends and family members last year was a little bit scary … but they were never going to be brutal about the feedback (I hoped) and, if they did, I’d be able to convince myself it wasn’t their genre/it wasn’t quite ready/they’re not experts or whatever excuse I decided made me feel better. Sending it to the NWS was also a slightly nerve-wracking moment … but all I was going to get back was a critique which would make me feel good about some parts (I hoped) and give me some constructive guidance on improving other parts. Even sending the first 6,000 words to a Harper Collins/Marie Claire competition has only made me feel mild apprehension … because I’ll probably read an article in a couple of months announcing the winner and realize I wasn’t short-listed because I’m assuming there will be far too many entries for them to reply personally to say “no”. But if I send it out to an agent or a publisher, I’ll get a response. I’ll get a letter or an email. I’ll get a “no”. Or perhaps I won’t. But I’ve convinced myself it will be a no. Perhaps that’s because I’ve lost my job and had little success in finding a new one so I’m feeling like a big fat reject all round just now. So I’ve spent the summer avoiding the final edit. Yes, I’ve had days where I couldn’t write; daughter to entertain, appointments to attend. But I spent half an hour sitting on the landing yesterday with a pair of tweezers picking out stuck bits of paper in my office shredder. Was that really the most important thing I could have done with that time? It’s not like the shredder was even jammed or going slow! I have several other examples of such procrastination that I won’t embarrass myself by sharing. My other half put his foot down this summer and said that I didn’t have to rush out and get a temporary job (I have a few irons in the fire I’m waiting to hear on) but he expected me to do things around the house if I wasn’t working. Fair enough. But after a few days of hard graft painting the lounge, I could have put my foot down too and said I was writing for a day. But I didn’t. Because it’s easier to blame him than me for not finishing that MS. And if it’s not finished, then I can’t send it off … and nobody can tell me it’s not good enough! At the RNA Conference, there was a session called, “Feel the fear and do it anyway.” It was all about identifying what stops you doing things (usually yourself) and finding ways to overcome them. The leader of this session is a life coach. It was a good session but, as a coach myself, I was familiar with everything covered … yet it’s so damn hard to apply it to myself. I could coach and support anyone else who needed it but it would be a case of do as I say, not as I do! An hour ago, we got back home from some commitments we’ve had today and hubby said he’d look after Ashleigh so I could work on my MS. Crikey! I think it’s because he’s made a decision to join the local archery club through whom he’s been attending a trial course. This will take time and commitment so I think this is his way of recognising I need time for my ‘hobby’ too. Only I don’t want it to be a hobby. I want it to be a career. Which means I have to send my MS off … which means I have to finish it … which means I should be working on it now instead of writing this blog. Will someone slap me about with a cold wet kipper please and make me get my act together before novelrejectionphobia turns me into one of those writers with a PC full of manuscripts that have never seen the light of day just in case someone says they’re not good enough. Because what if I am good enough? What if they love my work? What if they want to represent/publish me? What if I become a bestseller? It could happen to me, couldn’t it? I could have the talent and timing to make it? Right, that’s it. I’d better get my MS out now and polish it off. Could be in an agent’s inbox by the end of the week if I get my finger out. Mind you, it’s only 20 minutes until teatime and that’s not enough time to do anything now … or is it?! Help!!!!!!!!!!!!! The Wednesday Wondering – Walking in Whose Shoes? If you could walk in the shoes of one author for the day, who would it be and why? I would love to walk in the shoes of Judy Blume. Looking back I realise just how much her books helped me in my teenage years. They helped me to realise that I wasn’t alone in the everyday challenges that I faced, from adolescence and discovering boys to friendships and family relationships. I would love to witness Judy Blume’s research journey from developing a strong idea and themes for a book, to the development of characters, and how she got the dialogue of those characters just right. She is an amazing, strong writer and I am also curious about how she coped and how she defended her writing when she faced hate mail and arguments that her books should be banned from school and library shelves. Judy Blume is an incredible, strong writer who has stood up for what she believed was right. I will always admire her honesty in her books and her willingness to discuss real issues faced by so many of us growing up. When I first read this week’s Wondering I couldn’t think of any authors that I admired who had the kind of interesting lifestyle that I’d like to experience for a day. Then I thought there is someone and he’s a screenwriter so does he qualify? So I did some Googling and discovered that he’s written comic books so he is actually an author as well. The person whose shoes I’d like to walk in for a day is Joss Whedon. I think he’s a genius. I loved Buffy and more recently Firefly. I don’t know anyone who can write dialogue that’s as fresh and quirky and yet realistic. He’s also good at the big concepts too. Some of them don’t work too well and he admits that and moves on and I admire that about him. I’d love the chance to experience his working life and I’m sure I’d learn a huge amount about character development and how to tell stories. Another great question. I think it would be Stephen King, I would love to walk in his writing shoes for a day and if he didn’t want to share then I’d love to have spent the day as Jane Austen to see where her inspiration came from and to meet the original Mr Darcy although he’d have a tough time beating Colin Firth. So, that’s what some of the Write Romantics have to say? What do you think? Is there anyone who you’d like to stalk be around for a day or swap lives with for a day? We’d love to hear about it. Please post a comment. If you’re new to the blog and don’t know how to do this, click on the heart to the right of the title and that will bring up a comments section at the end of the posting. Thanks in advance for joining in. Today I’m posting about the online world that is becoming increasingly important to writers. Not only can we email submissions and check out publishers and agents guidelines with a few clicks of a mouse, but we can also become active within a community that helps us to develop as writers, whether we are published or still at the very start of our journey. Have a read of my post and feel free to make comments on this topic…there we go, already a benefit to being online! I’d like to start by talking about conferences. These events are a great opportunity to network, make new friends and learn even more about the craft of writing. But what happens when you can’t make the conference itself? The Claytons 2013 is what happened for me! I was unable to make the RNA Conference this year – well, I do live in Sydney, Australia, so understandable really – and I couldn’t make the RWA (Romance Writers of Australia) conference either as it was held in Freemantle, WA so it worked out a bit too costly to attend. The Claytons 2013 is an online conference organised by the RWA for those who are unable to attend the actual conference for whatever reason. I was a bit dubious about what this experience would bring and wondered whether I would get much, if anything, out of the experience, but I shouldn’t have worried. The Claytons 2013 was an unforgettable experience. It was held in the chat rooms for RWA members and began with a cyber-cocktail party which was heaps of fun as we all thought about what we would ideally like to drink, brought to us of course by the heroes dotted around the room albeit in our imaginations. The organisers used word play games to get the chat happening although just like an actual conference, you can probably imagine that a group of women didn’t need much encouragement there! To keep order at the conference, which took place the following day (thankfully only cyber hangovers to deal with!) the organisers also gave cues as to when we needed to quieten the chat room ready for a presenter. Guest speakers at the conference delivered everything and more. We heard from Alexandra Sokoloff, American Novelist and Screenwriter; Valerie Parv, Australia’s Queen of Romance who has sold 25 million copies of her books worldwide; and finished the conference on day two with a question and answer session with Charlotte Ledger from Harper Impulse. As well as online conferences, writers utilise many other tools at their disposal. Some writers hold virtual launch parties for their books and the views seem divided as to whether this helps or not. I would love to hear from anyone out there who has either held an online launch party or who has attended one. Being a part of The Write Romantics has shown me just how much support writers can get in the online world. I have never met any of the ladies on this blog but I feel as though I know them pretty well. I can email when I’m feeling low about my writing, share any joys that come my way during the journey and take comfort in similar experiences by sharing knowledge. I must admit that I’ve had a Facebook account for a long time but it’s personal and used for sharing news and photographs with close friends and family. But, with the online world comes a Facebook “page” on which we can promote our writing to anyone. I guess it’s kind of like sticking up a poster to advertise oneself as a writer and then being able to paste it to noticeboards all over the country and internationally as well. I wonder, has anyone had much experience with a Facebook page? Has anyone found that it’s a good way to build a reputation as an author and to gain a fan base? And then we have Twitter which I have found is a good way again to share knowledge – plenty of people I follow add links to their Tweets and as I follow many writers, agents and publishers, these links are a great learning tool with hints and tips including how not to approach and agent, calls for submissions, as well as reviews of other authors and their work. It’s also a great way to get to know a little bit about an agent if you’re thinking of approaching them for representation. Not only does it help to discover their personality traits and perhaps indicate whether you could “gel” in your professional relationship, but it also helps you get to know the sort of writing that they represent. Some writers whom I’ve followed on Twitter do tweet a lot of “Please buy my book” type pleas, but the writers whom I admire the most engage in conversation if I complement their books and that to me generates a huge amount of respect for them and their work. It’s also a big encouragement for me to buy whatever they write next. You know what it’s like: with favourite authors I rarely read the blurb, I just buy the book and dive straight in. The online world enables us to communicate with editors, agents and of course readers from just about anywhere. The online world has linked writers, agents and publishing companies from all over the world and long may it continue to do so in a profession where it’s easy to feel lonely and as though you’re walking solo on a journey with an unknown final destination. Please share your thoughts and views on this post…and I will of course respond! Who would you like to play the main character(s) in your book if it were made into a film? OR Who would you love to see the main characters in a book you love that hasn’t yet been made into a film (or perhaps a remake if you hated the film version that has been made)? I think this Wondering has really captured the imagination of the group as most of the Write Romantics have responded to this one and have all chosen their own books. I think it’s such a dream scenario for us all that, not only will our books be published, but they’ll be made into Hollywood blockbusters too. Well, it has to happen to someone. Why not us?! If my book ever made it to film I would love to see Jessica Lucas play Jenna. When I saw Jessica Lucas’s photograph she felt right for the part. Her mother is white and her father is black, just like my character in the book. For Jake, I would envisage an actor such as Paul Walker with the lighter hair, the blue eyes. I could see him playing the part of a vet too, and looking ruggedly handsome as he works. I could see these characters together in a film … who knows, maybe one day. After all, we can all dream! The main characters in Beltane are Finn, Zoe and Maeve. Zoe is new to the world of magic and has a lot to deal with in terms of coming to terms with her own gift and what’s happening around her. I think Karen Gillian (Amy Pond in Doctor Who) would be a fantastic Zoe. Maeve pretends to be a spiritual healer but is actually very cold and calculating. I think an actress like Lindsay Duncan would be wonderful. I would love to see Sigourney Weaver sporting a very British Accent to play my main character Police Officer Annie Graham in The Ghost House and of course Detective Sergeant Will Ashworth would have to be Brad Pitt or actually I have a bit of a thing going on for Kevin Bacon at the moment so either of them would be fantastic. I massively struggled with this one because I tend to have a good idea of the basics of appearance but don’t fill in the blanks fully. I once tried to find some images to inspire me and I didn’t feel anyone quite cut it but I’ll have a go for here because, as the host of the Wednesday Wondering, I’m determined not to back out of responding to one! I will not be defeated! I have 5 main characters in my novel, Searching for Steven. Sarah is the protagonist and is a strong woman, a hopeless romantic and slightly ditzy at times. She’d need to eat a few pies for the role but Anne Hathaway would be my first choice. Sarah has two best friends, Clare and Elise. Clare is Irish, blonde, stunning, a massive flirt, a commitment-phobe, a career woman and very straight-talking. No idea if she can do an Irish accident but the closest I can think of in looks is Charlize Theron although she is a bit old for the character (sorry, Charlize – you’re still beautiful!) Elise is a very gentle soul and loyal friend. She has auburn hair so that limited me slightly (unless we get the dye out). Not perfect but we’ll go for Amy Adams or Isla Fisher. For the boys, I turned to Glamour Magazine’s Top 100 Sexiest Males to try and get some inspiration but it didn’t actually help! There are some very odd choices on there! Sarah has two men battling to steal her heart. First love Andy would probably be played by Matthew Goode (who I adore in Leap Year) and new friend Nick would be Patrick Dempsey (although he’s also a bit too old so may need to be tweaked in the editing suite!) Spookily enough, they’ve both been in favourite films of mine with Amy Adams (Leap Year and Enchanted respectively) so maybe she needs to be Elise as she’s worked with them before. Or maybe not because she was their love interest in those films and if the men start fighting over Elise instead of Sarah … well, we have a completely different book! In the book I’m writing now I definitely had in mind Laila Rouass and Edward MacLiam when I came up with my main characters. She’s just beautiful, and I do love an Irish actor… They played Sahira and Greg in Holby City, a storyline I got tremendously involved in as it was so emotional, and sad since they didn’t end up together. Unfortunately, when my book comes out and is made into a film *much laughter* they won’t be able to play the actual parts unless they can play quite a bit younger. But who knows, maybe they can! My answer would be that I would have liked Colin Firth ten years ago, around the Bridget Jones diary era, to play the hero in my book, but he has gone just a tiny bit too crinkly around the edges now – haven’t we all? Or maybe it is just me and Colin! Got a thing for Ewan McGregor at the moment after watching him in tight armour in Jack and the Giant Slayer, so I think I’ll cast him. I’d like my heroine to be played by Holly Willoughby. Okay, I know she’s not an actress, but she’s got just the right look and sense of humour and I am sure she’d be able to turn her hand to it – after all, she’s apparently a published children’s author now too, but I have decided not to hate her too much for that! Please join in. We’d love to hear from you. Research- for some the thought of it is a joy. Maybe you are an author who loves to spend time in the library going through the reference section, and loves every minute of what you are doing. Or are you someone who would prefer to be practical in their research, to be on the scene and experience what it would feel like to be in the place you are writing about, to walk the path that your hero or heroine will be journeying on. To imagine being in their shoes. I wanted to know how far an author would go to research their novel. So I asked Sue Moorcroft and Henriette Gyland about how far they would go. They have both been good enough to give me an insight into what research they are doing for the novels they are currently writing. Sue. I do keep thinking that I ought to write about things I want to do (fly a helicopter, drive a car around Silverstone circuit, drink very expensive wine) but it never seems to work out that way. Soon I’m going on a 42′ seagoing boat when, usually, I avoid boats on the sea like the plague. But I want to know more about the boat than I can get from the brochure-how it feels/smells/moves, how easy it is to get up on the flight bridge and stuff like that. This book, ‘In the same boat’ (working title), is also making me scuba dive this September, when I haven’t been down for six years. But I’m looking forward to that a lot more than going on the boat. For my next book, I think the heroine is going to have a face lift and find a toy boy….Maybe she’ll get be the one who drinks expensive wine, too. Sue, I take my hat off to you. Now I wouldn’t mind going on the boat, even though I can’t swim, but the thought of scuba diving just sends a chill down my back. Being under water must be an incredible experience, I’m not sure I could do it. I can honestly say if you need help to do any research regarding the possible novel about the heroine who drinks expensive wine, gets a face lift and finds a toy boy, I would only be to happy to help, I know sometimes this can be a burden, so just want to be there to lend a helping hand. Henri. I know what you mean. There is nothing better than to stand in a place where your novel is set, to feel the atmosphere, to picture the place it used to be, and just be a part of it. To visualise your hero or heroine walking or riding across the heath. Sometimes you may hear voices that seem to whisper to you from the past. It brings the past to life. And to have a dress from the Georgian period would be something special. I hope one day to see you in it Henri. What better way to do research, than to live it. My novel is set in the world of lingerie, so it has been an interesting time for me, as I have had to go into some rather interesting shops, to have a look at what my heroine would be looking at to wear and sell. So when I went into one well known shop (my friend advised me not to go to the back, just stay at the front) I nearly fainted when a very helpful male assistant smiled and asked how I was today! All I wanted was to sneak quietly in and have a look around, and also feel the material of the lingerie. This due to a scene in my book, and leave. Yes. Thinking about that particular day, I think scuba diving is becoming rather appealing. Also I have been fortunate due to living abroad I have experienced the tail end of a typhoon. to sit on a balcony with a cup of coffee, as the wind begins to blow ferociously, almost bending the tree branches to the ground, watching as the rain lashes the ground, sending its spray against my skin. All this is going to be a part of what is going to be in my novel. It seems that Sue and Henri love to research in a practical way, to experience and feel what their hero/heroine would experience. To put themselves in a different pair of shoes. To go as far as it takes. And I confess I am more a practical researcher, and it is fun, and sometimes a bit scary. Thanks Henri and Sue for sharing your answer to my question, and telling us about how far you would go for your novel. So, having read everyone’s answer to my question, I just want to ask you, How far would you go to research your novel? Good morning to you all and welcome to another Wednesday Wondering. What’s the most romantic thing that has ever happened to you/that anyone has done for you? Awww. Love is in the air! Here’s what some of the Write Romantics had to say. For me it was not long after I met Steve my husband. He was going on a lads holiday to Tenerife and the day after he went I got the most beautiful bouquet of red roses and a huge heart shaped box of chocolates delivered. Needless to say it was a one off and has never been repeated although we’ve been married almost 23 years. This was a fun “wondering” to think about as it took me back through the years. I would have to say that proposals and weddings get me every time, so I’m afraid my response may be a little cliché! When we holidayed in the UK in 2003 my husband and I rented a small powered boat and took it out along the Norfolk Broads. The day started out beautifully with the sun shining, the smell of summer. We moored up outside a pub and enjoyed a Ploughman’s lunch (you have to absorb all things UK when you’re on holiday!) When we returned to the boat the heavens opened and the temperature had dropped. We set the boat free ready to chug back to my parents’ place, but the boat wouldn’t start. Luckily we had taken a mobile with us and managed to call the owner of the place where we had rented the boat but it took a shivering, wet hour or so for him to arrive whilst we huddled in the boat to try and stay warm and drifted away from the river bank. Apparently my husband was going to propose on this day…but he decided it wasn’t quite the moment. Luckily for me, my husband found his moment at another pub lunch – this time with prawn cocktail baguettes – the day before we were due to return to Australia. This time the sun persisted and as we strolled along the river bank . He got down on one knee and asked me to marry him. I think that one of the most romantic things for me was that I knew that something was up…he never gets nervous or tongue tied and it made the moment so special to see how much it meant to him, especially when he told me about his failed attempt the first time and that he had the ring tucked into his fleece pocket all day, paranoid that he would lose it with all the drama on the boat! The most romantic thing ever was when a boyfriend put a fresh peach in a bag under my windscreen with the words ‘a peach for a peach’ written on the bag. Aww bless him. Hubby and I have just been giggling because, having been together for over a decade, I feel I should be writing about something he’s done but I couldn’t think of anything. So I asked him. And he couldn’t think of anything either! He said, “Ooh, there’ve been so many …” then cracked up giggling, eventually concluding with, “You’ll have to make something up!” Well, I am a writer so that should be easy but that’s not the point of this segment! So, I’m going to ditch the hubby (for this slot, not in real life!) and go back to my 1st year at university. A close friend and I had started seeing each other about a month before Valentine’s Day. On Feb 13th, we’d gone to the bar opposite our Halls of Residence with another male friend and the pair of them kept acting strangely and asking random questions about whether I liked surprises and whether I would be going straight to bed after we left the bar. I knew they were scheming something but wasn’t sure what. At midnight, I was in my room about to get ready for bed when there was a bit of a commotion in the corridor followed by a knock on my door. My boyfriend was stood there in nothing but a pair of white boxer shorts with red hearts on them, with a red rose between his teeth, clutching a bottle of bubbly in one hand and some chocolates in the other (although I may have made up the chocolate part – wishful thinking!) He’d run down two freezing cold flights of stairs dressed like that and had encountered several other students en route to his dismay and embarrassment! Later that day, I left my door propped open while I made a cup of tea. When I returned, there was a Sad Sam (remember them – cute puppy dog with huge sad eyes?) on my bed and a card. I assumed they were from the boyfriend and was touched that he’d bought me a cuddly and snuck it into my room. Only they weren’t from him! They were from the lad who lived next door who was a good friend of mine and my boyfriend’s! The card was full of declarations of love for me and how he knew I was taken but he’d be there for me if things went wrong with the bf! Eek! Romantic … but completely inappropriate! Then, as I was wondering what to do, the bf appeared so I had to confess. He wasn’t a happy chappy at all. I assured him that he was the only one for me … but was secretly very flattered. I’d had zero success with boys before going to uni and now I had two fighting over me. Go Julie!!!! It was romantic for me receiving a single red rose on the morning of my wedding day, with a note to say ‘I can’t wait to see you’ – from the man I’m now married to of course! Occasionally he will pick a few daffodils in the spring and give them to me but he doesn’t say it with flowers really. I often wonder if he was put up to the red rose. Nowadays, after almost twenty years of marriage, the romantic things are the gestures that show he cares, not great bunches of flowers. Only last month, when I was due to go away for the RNA conference he knew that the farm silage was going to clash. Usually I would be up to my eyes in making food for endless streams of men, but he didn’t tell me and organised others to make food and help on the farm so I could go, knowing how important that weekend was to me. I’m not even sure I’d want to be bombarded with flowers, perfumes, chocolates etc, but I love it when my heroes show their romantic side! What a fabulous mix of different stories. I think I’m going to spend the day racking my brain now, desperately trying to think of something romantic the hubby has done for me (other than proposing) cos there must be something. Mustn’t there? If not, get your act together Heslington!!!! Over to you. Please do share your experiences. We’d love to hear them. And they may even inspire a future novel! A couple of weeks ago, I went on holiday to the Lake District. 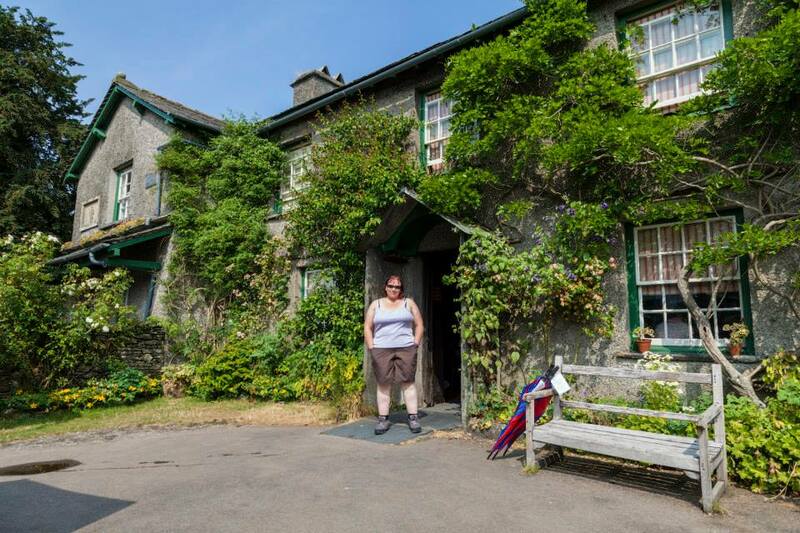 This is a place I love and have visited on many occasions but this was my first visit to Hill Top Farm in Near Sawrey, the first property Beatrix Potter purchased in the Lakes. I think anyone who has heard of Beatrix Potter would be interested in (and enjoy) visiting this lovely house and garden but, as a writer, I found it particularly fascinating. Beatrix, getting over the untimely death of her fiancé, found inspiration in the house, gardens and surrounding areas, setting many of her subsequent books there. The Tale of Tom Kitten is set in the house and garden, The Tale of Ginger and Pickles is based in the village and The Tale of Jemima Puddle-Duck featured a duck that strayed from Hill Top to pick just three examples. Wandering around the property, knowledgeable guides were on hand with copies of various books where visitors could match the illustrations to exact pieces of furniture and rooms in the house. My six-year-old daughter loved doing this. And so did I! At Beatrix’s wishes, Hill Top’s rooms and furnishings “should be kept in their present condition” so that visitors could see where inspiration had come from and I really could see it. Her desk was laid out with letters and books and I must confess to having serious writing-desk envy (lots of drawers and cubby holes!) and could really picture the talented writer and artist at work. I could also see why she’d be inspired living in such a lovely farm in such a pretty part of the world. Here’s a picture of me standing in the doorway of Hill Top. Please forgive the pasty legs!!!! All of this got me thinking about inspiration. Two weeks ago Deidre blogged about locations for books and asked whether we like fictional or real settings. Last week, Alex took this a step further and blogged in more detail about the two locations (Glastonbury and Orkney) that have inspired her novels. I’d like to look at inspiration in general. Where does it come from? Does a location inspire a story? Does a story inspire a set of characters? Does an idea for a character inspire the plot? I guess it can happen in many ways. For me, personally, the inspiration for my first novel didn’t come from a person or a place. It came from something that happened to me. I’d always wanted to write but had no idea what the story would be. When this particular thing happened, I thought, “What a great idea for a story” and once that thought popped into my head, it wouldn’t go away. Suddenly I had my protagonist too because she’s predominantly based on me although how she reacts to “the thing” in my novel isn’t necessarily how I reacted to it because her reaction makes a far more interesting story. The plot unfolded by me constantly asking myself, “What if…?” and “Why…?” which led to new characters, settings and experiences. Location-wise, my book is set in a fictional North Yorkshire seaside town although it’s based very much on a combination of Scarborough (where I live) and Whitby just up the coast from us. These two settings in turn inspired certain events in the book as there is so much stunning scenery in this area that it would be impossible not to be inspired by it. Scarborough has a castle so I have used that. Both locations have lighthouse piers and I have used that concept but created my own version in my mind for a couple of key events. To conclude this piece, I thought I’d do a bit of a research on where some very famous writers got their inspiration from. I started with one of the most obvious – JK Rowling – but ploughing through several pages of Google just revealed that she got the idea for Harry Potter in 1990 while staring out of a train window on a journey from London to Manchester (or was it Manchester to London?) I read another article saying that she spent the train journey imagining what Hogwarts would be like and that, by the time she got off, she had most of the characters. But this doesn’t really tell me where the initial idea came from. Was she thinking about writing a book set at a boarding school and trying to challenge herself to do something slightly different resulting in lots of “what if…” questions before arriving at Hogwarts? Was she thinking about writing a book for children and had had a conversation with someone about witches and wizards which set her creativity juices flowing? I don’t know. I don’t imagine for one minute that she stared out the window at some fields and suddenly this whole world was created. There must have been some sort of trigger. Mustn’t there? Over to you. If you’re a writer, where has your inspiration come from? Something you’ve experienced? Something you’ve read? Something you’ve overheard? Or did it just materialize? I’d love to hear more. And if you’re a reader, what do you think might inspire you to write?